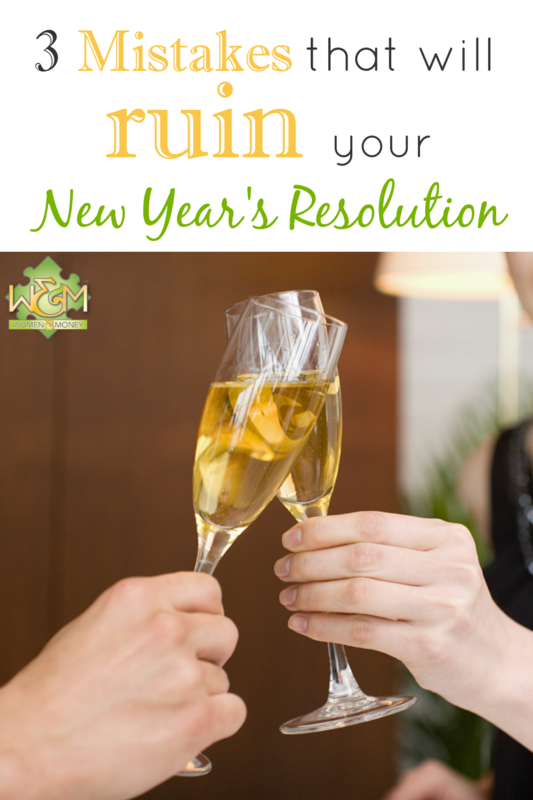 3 Mistakes that Will Ruin Your New Year's Resolution - Women and Money Inc. If we know how often we fail our resolutions, why do we create them in the first place? Most people feel that the beginning of a new year is a ‘fresh start’ and the perfect time to begin rolling out the perfect version of themselves. The act of thinking about, planning for, and trying to make changes in our lives is encouraging and uplifting. We feel overwhelmed with hope and excitement to take on new challenges. We join gyms, throw out our cigarettes and ‘bad’ food, cut up our credit cards, and resolve that this year will be ‘our’ year. But how can we keep motivated when we sense that things aren’t going exactly as planned? We often realize too late that good intentions aren’t enough to carry us towards success. Without a proper plan and reinforcements, achieving our goals isn’t possible. When unexpected things happen or circumstances change and our goals are threatened, we benefit from having a solid plan in place to prevent backsliding. Why do goals often fail and how can you ‘fail proof’ your goals? Most people come up short with their resolutions and goal setting because they make these three common and avoidable mistakes. Goal setting is a lot like grocery shopping – it’s easier if you make a plan (and a list!). Without writing anything down, it can start to seem like everything and anything is possible. If you feel like you could go anywhere and do anything, you’ll probably get overwhelmed. But the trick to goal setting is to think big and plan small. The key is to focus on aspects of your life that you want to improve upon and then choose one or two items at a time. Usually, the formation of one or two new habits that are linked to an unwanted habit (quitting smoking, for example) will lead to improvements in other areas of your life, as outlined in the book The Power of Habit by Charles Duhigg. Resolutions become clearer and more focused when they’re given the consideration, development, and check in points that they need to work successfully. In other words, goals need a (preferably written) strategy in order to be realized. Trying to ‘make a go of it’ without a plan is only setting yourself up for failure. When challenging things happen and there’s no plan, safeguards aren’t in place to prevent backsliding. When starting a new goal, it’s easy to get swept up in seeing your progress as black or white. The problem with an ‘all or nothing’ approach is you discredit the progress and ambition that you’re trying to cultivate. By creating such a clear cut definition of success, you prevent yourself from recognizing the steps that are leading to your ultimate ‘end’ goal. Finding ways to celebrate your milestones is very much a part of the goal achievement process. Stop seeing your end goal as the only thing worth aiming for. By incorporating these suggestions into your resolution process, you can prevent backsliding from taking place. If you already feel that you’ve ‘failed’ at your resolution(s), you can still regroup your efforts and reclaim your goals. It’s not too late if you start today!